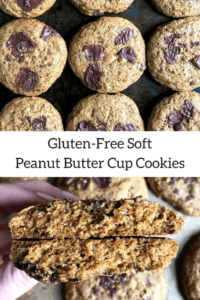 These Healthy Soft Peanut Butter Cup Cookies are going to change your healthy cookie game forever! So a few weeks ago, I quit my job. It was crazy, exciting, scary, and nerve-wracking all at the same time. I’ve never really ever been faced with a choice like that before, but I knew it was time and I felt like I was ready to do it. In an effort to make the blow a little easier for my colleagues, I decided it was probably best if I bribed them with sweets. Baked goods always make things better, right?! 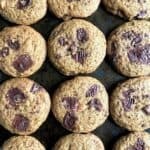 I came home one night during my final week and realized I could squeeze in making a batch of cookies if I came up with a quick recipe. I figured these would just be a test recipe and may not even end up good. Lately I’ve been making things three or four times before they even go on the blog because I want the recipes to come out just right. Well, I only had to make these babies once because they literally came out PERFECT. I couldn’t even believe when I bit into one how soft they were, yet held together perfectly. They were delicious and I couldn’t wait to bring them in. So many of my colleagues absolutely loved them and were asking for the recipe, so I knew they were a hit. I probably could have also figured that they liked them since the container was gone before 11:00 a.m. 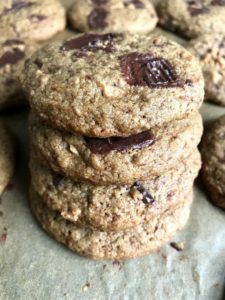 If you’re looking for a quick, healthy cookie that is absolutely delicious – these are your guys! Plus you can change up the toppings if you only have chocolate chips, or want to add something else like other candies! 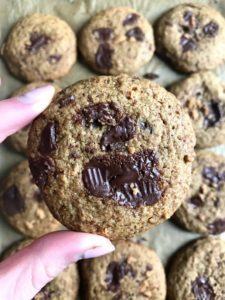 These soft peanut butter cup cookies are so fluffy and literally melt in your mouth, plus they are healthy! Preheat oven to 350F and line a baking sheet with parchment paper or silicone liner. In a bowl, mix together oat flour, baking powder, baking soda, and salt. In a small bowl, mix together, egg, coconut oil, coconut sugar and vanilla. Stir in peanut butter cups and roll into balls. Place on baking sheet, pressing down slightly, and bake for 10-12 minutes or until slightly golden. Let cool completely before serving. Store at room temperature.